Kabaddi is a contact team sport. Played between two teams of seven players, the objective of the game is for a single player on offence, referred to as a "raider", to run into the opposing team's half of a court, tag out as many of their defenders as possible, and return to their own half of the court, all without being tackled by the defenders, and in a single breath. Points are scored for each player tagged by the raider, while the opposing team earns a point for stopping the raider. Players are taken out of the game if they are tagged or tackled, but can be "revived" for each point scored by their team from a tag or tackle. For the circle style kabaddi, see Punjabi kabaddi. It is popular in the Indian subcontinent and other surrounding Asian countries. Although accounts of kabaddi appear in the histories of both ancient India and ancient Sistan, the game was popularized as a competitive sport in the 20th century by India; it is the state game of the Indian states of Andhra Pradesh, Bihar, Haryana, Karnataka, Kerala, Maharashtra, Punjab, Tamil Nadu, Telangana, and Uttar Pradesh. It is also the national sport of Bangladesh. Two major disciplines of kabaddi exist; Punjabi Kabaddi, also known as "circle style", refers to traditional styles of the sport that are played on a circular field outdoors. 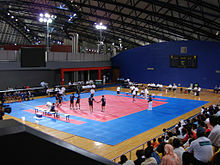 The "standard style", played on a rectangular court indoors, is a discipline played in major professional leagues, and competitions such as the Asian Games. 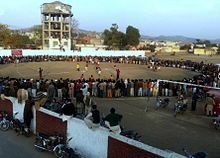 The game is known by its regional names in different parts of the Indian subcontinent, such as kabaddi or chedugudu in Andhra Pradesh, kabaddi in Karnataka, Kerala and Telangana, hadudu in Bangladesh, bhavatik in Maldives, kauddi or kabaddi in the Punjab region, hu-tu-tu in Western India, hu-do-do in Eastern India, chadakudu in South India, kapardi in Nepal and kabaddi or sadugudu in Tamil nadu. The word "kabaddi" is derived from the Tamil word "kai-pidi” (கைபிடி, "to hold hands"). In the international team version of kabaddi, two teams of seven members each occupy opposite halves of a court of 10 by 13 metres (33 ft × 43 ft) in case of men and 8 by 12 metres (26 ft × 39 ft) in case of women. Each has five supplementary players held in reserve. The game is played with 20-minute halves, with a 5-minute half break in which the teams exchange sides. During each play, known as a "raid", a player from the attacking side, known as the "raider", runs into the opposing team's side of the court and attempts to tag as many of the seven defending players as possible. For a raid to be eligible for points, the raider must cross the baulk line in the defending team's territory, and return to their half of the field without being tackled. While doing so, the raider must also loudly chant the word "kabaddi", confirming to referees that their raid is done on a single breath without inhaling. A 30-second shot clock is also enforced on each raid. After the establishment of a new kabaddi organization named World Kabaddi Federation, a world cup in 2019 at Maleka, Malaysia will be organized. It will be the largest world cup in kabaddi history, consisting of 32 men teams. ↑ "The importance of professional leagues". The News on Sunday. 2018-11-25. Retrieved 2018-12-19. ↑ "Beleaguered no more: Kabaddi gains popularity in Pakistan". The New Indian Express. Retrieved 2018-12-19. ↑ "Kabaddi league: Pakistanis axed from roster". The Express Tribune. 2015-07-21. Retrieved 2018-12-19.